And I’m actually even incredibly excited to just hear what Rhiannon will sound with a newly formed band. 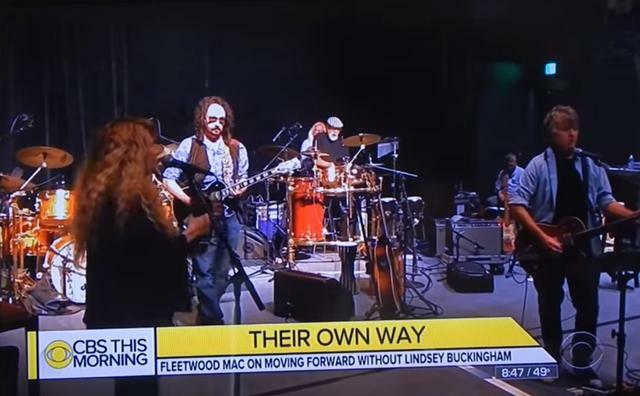 Not blaming Lindsey at all, because the song was stale in many different live versions including solo, but she has a tendency to breathe new life into a song when inspired by people like Dave grohl, Tom Petty and others being onstage with her. Maybe Mike Campbell will bring back the Rhiannon guitar solo and Stevie wouldn’t fight him on that like she would Lindsey. Last edited by Sugar Mouse : 05-21-2018 at 12:12 PM. We need a separate thread for this topic. What do you want to see Christine perform live? And Stevie? And Mike Campbell and Neil Finn? I know it's early but it will be neat to compare this thread with what FM actually plays. Surely you jest? Hate to burst your bubble, but I don't think they're dropping GYOW from the set. You may get "Stand Back" though. I agree, they will perform Go Your Own Way. It's one of my top 4 FM songs, so I'm ok with that. But jwd, I didn't see your list. C'mon, what do you think they're going to perform? Is there anything FM could perform that would tempt you into seeing them? Just curious. Last edited by bwboy : 05-21-2018 at 09:33 PM. Thanks for posting this, Sugar Mouse. Are you very familiar with Neil's live shows? The reason I ask is, I'm curious if he always stays to the left on the stage like he does in this video. Because in FM, Christine is always on the left, Stevie in the middle, and Lindsey on the right. Even when Rick and Billy were in FM, that was the same order. I figure Neil will play in Lindsey's usual position, but Mike will probably wander the stage a lot, interacting with Stevie, Neil, and John. I've seen Neil perform many times and he doesn't seem to have a preferred side. I've seen him on the left and I've seen him on the right. He usually rotates between piano and guitar during shows, but I assume he'll mostly be on rhythm guitar in Fleetwood Mac. He also likes to wander around during shows. He really loves collaborating and allowing musical magic to happen in spontaneous moments. Those with interest in learning about Neil's performing and songwriting may want to check out the lecture he gave at Yale back in September of 2012. It was about creativity in music and I believe it's still online. I have to check that out. I'm sure it will be interesting. Here they are jamming together in Maui. I think that the girls will stay on the left together. Neil and Mike will be on right but Mike will probably move around a bit between Stevie, Neil and the rhythm section. I think GYOW can stay in the set. This band have never hidden their drama. They wear it on their sleeve. It's also a crowd favourite that everyone sings along to. Last edited by Missy : 05-22-2018 at 02:15 AM. As has been noted, Lindsey cannot be replaced. But I am hoping the band uses this as a chance to do some career showcase/retrospective of their earlier work, which would be very worthwhile. And I think there's a possibility of new material being produced down the line. Sad that Lindsey won't be there but I am sure the quality of these shows will be very good with the first rate talent involved. And we'll see where it goes from there. For me, I think it's best to think of this as a "new band" as I expect the setlist and sound to be very different. I hope they dig deep into the Danny Kirwan and Bob Welch pool of songs as there are some gems there than should sound sweet with Mike and Neil. Danny's song "Dust", in particular", sounds like it could have been written by Neil. Danny (and Bob Welch to a lesser extent) had a very similar songwriting style to Neil with sweet melodies, introspective lyrics, and spacious musical textures. Well, since you asked, my number one song request would be "Crystal". I've always hoped they would do this song in concert. Having said that, I would not want them to do it now, without Linds. It'd be almost sacrilegious to do it, for the first time, without him. So just never do it, unless for some unforeseen reason, he returns. Then it would be even more amazing! For me, as Missy has said, I would hope that FM delves heavily into all their previous work on this tour. Songs from Peter Green, Danny Kirwan, and Bob Welch. Making it a true retrospective into what was EVER FM. THAT would be appropriate and somewhat makeup for the fiasco that has taken place recently. An all encompassing FM setlist would get me there! And that would be a hard list of songs to whittle down! I still do so very much love FM and all those fabulous songs they've given us. That is something I will never get bitter on. Crystal is in my top 3 FM songs, and is one I always wished they would have performed live. I finally broke down and bought the Buckingham Nicks Live from Alabama cd off eBay last week, and Crystal is one of the songs they did live. I have always been fascinated by this song. Why did Lindsey sing lead on it, for example. Did Stevie write it for him to sing? Or did he hear it and ask to sing lead? I always wished they would have written more songs for each other. It would be interesting to hear Christine song That's Alright, or Stevie singing lead on Blue Letter, or Lindsey singing Brown Eyes. Back to Crystal- I love hearing Lindsey sing those ethereal lyrics, he really gives the words gravitas that otherwise would have been lacking. I loved that song for years before I ever realized Stevie was the one who wrote it, and I was stunned. There was a femininity to the song, so since Lindsey sang it, I thought he wrote it, and I was like, "man, this guy understands the female mind!" Such a beautiful, simple song, and would have been incredible in an acoustic set with Landslide and Brown Eyes. But I can also see why Lindsey might have rather sang a song he had written instead. That's why I think it would be fine for Neil to sing Crystal, because there's no way in the world Lindsey would again, and I understand why. A short clip of Mick speaking on SiriusXM about the upcoming tour. It does sound like they'll be departing from the usual and are looking at material from full 50 year history. He's not that shallow. And I don't want Neil to sing it. But I do appreciate your mutual love for this song.